Since I've been doing a bit of work recently on System Center Dashboards I thought I'd quickly post this snippet that I've just done. 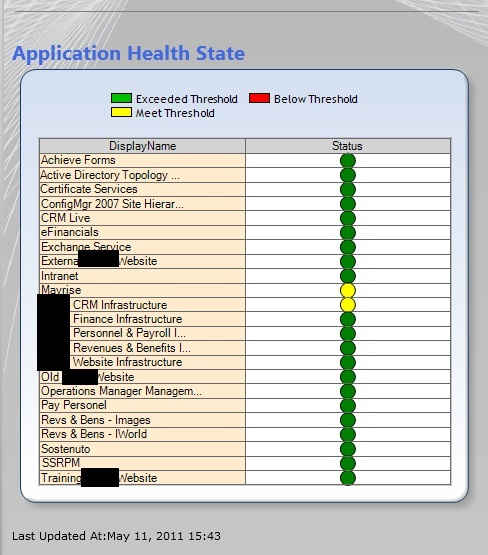 I'm lovin this post on SCOM DA dashboarding! 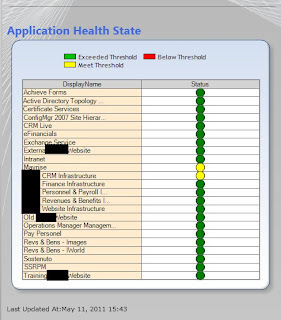 I've done quite a bit with the SCCM and SCSM dashboards within SCOM for my clients but didn't have the SQL 'Kung Fu' to tie in DA's into it until I saw your blog post today. I'm sure I am missing something simple but if you could provide me with more information or even the SQL query that you used for the scorecard, I'd be much obliged. I was wondering what was wrong there for a while, but then I twigged too. As I mentioned in the post, when you're adding the SQL to the dashboard, you need to chop the case statements out so that the dashboard has the numerical values to work with, sorry, should have put that bit in bold! Glad you liked it btw! I liked your solution that much that I put together my own SCOM dashboarding series of blog posts. I've given you the credit of course for the Distributed Application Dashboard and also linked to your blog. I don't mind at all Kevin, and I must say, what an amazing set of posts you've done!! I'll create a new post to reference yours if that's ok? I don't mind at all Steve, I appreciate the comments and thanks again for your original post! tI love your guys input on this. I am currently working on a project to make a dash similar to yours with SCOM 2007 R2. I am having a problem though which is puzzling me. I am getting multiple healthstate for each distributed application i add to the query. 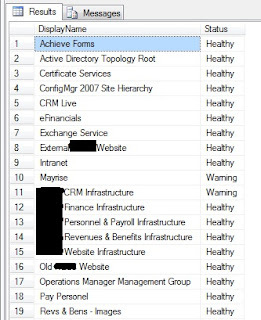 One that i know is critical, i added and it shows in the preview data window 3x and heathstate 0,1,3.